Chipmaster-XZ Extended Reach | Welcome to A.P.E. The Chipmaster XZ is a custom extended reach Z-Axis Rework System. 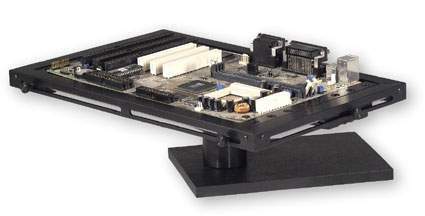 This unit is specifically designed for extremely large, custom infrastructure boards. When your board looks like a pizza box, the XZ is your unit. The Chipmaster-XZ is identical in specification to the standard Chipmaster-Z series except for the addition of an 18.5″ extended reach heater tube. This extended reach system provides easy clearance of the nozzle on oversized boards thus avoiding obstructions. Particularly convenient for awkward height components. Automated Z AxisThe Chipmaster-XZ automates the Z axis adjustment and assists the user in clearing the area after rework. It also helps access the component without concern of surrounding obstructions. The Chipmaster-XZ SMD-1003-XZ package, with optional features (see below), has been counted to introduce this unique system. These features ensure that the Chipmaster-Z functions as intended. 8100-1003-114-XZ Chipmaster 110v Z-Axis Unit Includes: Power Supply 110v, Extended Length (18.5″ reach) Reflow Head with 1.750″ of Z-Axis travel (1200watts), Digital Controller with all 4 modes of operation, 16″ x 20″ Frame Holder, Self-Contained Vacuum IC removal device, SMD Tool Kit, Halogen Light w/ mounting bracket, Chipmaster T and Sniper Demonstration video, Foot Pedal, Power Cord, and six user-selected nozzles. 8100-1023-114-XZ Chipmaster 220v Z-Axis Unit Includes: Power Supply 110v, Extended Length (18.5″ reach) Reflow Head with 1.750″ of Z-Axis travel (1200watts), Digital Controller with all 4 modes of operation, 16″ x 20″ Frame Holder, Self-Contained Vacuum IC removal device, SMD Tool Kit, Halogen Light w/ mounting bracket, Chipmaster T and Sniper Demonstration video, Foot Pedal, Power Cord, and three user-selected nozzles. Underboard HeatingThe SMD-1000-XZ is a necessary rework station when used with a Super Dragon or other fixed underboard heating system. It also serves as an economical alternative when used with the APE Dragon bottom Heater. A new range of Board Holders has been designed to be used with the Chipmaster-Z and other APE products. They include smooth action bearings and all round PCB support (see illustration below).